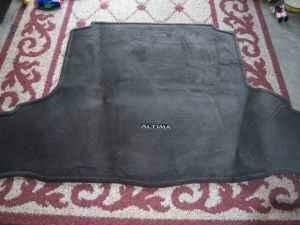 2002 -06 NISSAN ALTIMA TRUNK FLOOR MAT. IT HA STHE NISSAN ALTTIMA NAME IN IT. IT IS LIKE NEW. THIS IS A GREAT CHANCE TO REPLACE YOURS FOR A GREAT PRICE. THIS IS A OEM PRODUCT AND FOR $30.00 CAN NOT BE BEAT.